Most of America is disappointed with the performance of president Obama. They don't like Obamacare, don't like the direction the country is going in, and are not pleased with the state of the economy. While unemployment has gone down somewhat, people are dropping out of the workforce and many of the jobs created are part-time. Some of this can even be blamed on Obamacare. While some may say it is unfair to blame Michele Nunn for the presidents short comings, she does support Obamacare and its the Democrats that put Obamacare into law. She has refused to admit that she supports President Obama. This has been a source of embarrassment for her campaign. Some Democrats feel she should show more loyalty to Obama but others say it is smart politics for her to not admit she supported President Obama due to his lack of approval. In spite of his lack of approval overall, blacks have been heavily supportive. He has suffered only a small downturn from 90 to 80 percent approval. Nunn is counting on their support this Tuesday and expects over 90% from blacks while David Perdue is counting on whites with over 70% expected to vote for him. Hagan has had a small steady lead in the polls. Although Tillis has closed the gap he hasn't been able to over take her in the polls and the Realclearpolitics polling average still has her up by about 2%. Until recently, Tillis remained competitive, but trailed Hagan in the polls. After news broke that she skipped an Armed Services Committee hearing on the Islamic State to attend a fundraiser, Tillis’ fortunes began to improve. In spite of the overall mood of the country almost all blacks support President Obama and also support Kay Hagan. She is counting on a big turnout from minorities to help put her over the top. Most whites are supporting Thom Tillis. The people of North Carolina are not pleased with president Obama and are dissatisfied with the direcition the country is going in. They don't like Obamacare, are not pleased with the state of the economy, and they seem to want to take it out on democrats across the country. Growth has been slow and job growth has been anemic. Many of the jobs that have been produced are part time. It may not be Hagan's fault that NC doesn't believe Obama has done a good job but she did support Obamacare and votes with Obama almost all the time. Tillis wants to repeal Obamacare and that seems to be a popular point of view in the state of NC. He has criticized Hagan for telling the people they could keep their health plan and that turned out not to be true. Tillis points out the enormous cost to taxpayers of Obamacare and expanding Medicaid. He also says its costing jobs and forcing employers to turn full-time jobs into part-time jobs. President Obama’s lack of popularity is clearly hurting Mike Braley. The people of Iowa don’t like Obamacare, don’t like the way Obama has handled the Ebola situation and believe he has been to slow and passive in responding to the Isis terrorist onslaught in Iraq and Syria. Like the rest of the nation, Iowans are not satisfied with the state of the economy and believe as a nation we are heading in the wrong direction. It may not be Braley’s fault that Obama is perceived as doing such a bad job, but voters may hold him accountable since he votes with Obama most of the time. Joni Ernst has been able to use these issues during her debate with Braley. She ripped into Braley on Obamacare with regards to the fact that he claimed people could keep their healthcare plan if they wanted it. She said he either lied or didn't know and neither is a good option. She even ripped into him on abortion saying that he lied when he claimed he was against late term abortion and parental consent. She criticized Braley for not supporting a bill that would outlaw abortions after 20 weeks of pregnancy if the mother's life was not endangered. Braley was critical of Ernst for being against the right to an abortion except when the mother's life is endangered and perhaps some other instances that she did not specify. However the moderator also raised the issue that Ernst's opposition to early trimester abortions doesn't matter because it is settled law because of Roe Vs. Wade and legislature's will not be able to change it anyway. 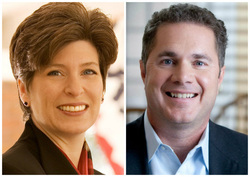 Braley attacked Ernst, claiming that she wants to deny women birth control. She fired back saying that she doesn't believe taxpayers should be paying for birth control and that any women is still free to purchase birth control. Joni Ernst wants to repeal Obamacare and while Mike Braley claims that would be bad for the people of Iowa. Ernst says Obamacare is bad for the nation, creates more government dependency, costs too much money, and is also costing too many jobs, causing employers to lay off workers and reduce their hours so they don't have to participate. Who do you think won the debate? Scott Brown has been able to cut into Jeanne Shaheen's lead in the polls but he still trails slightly. He still trails by about 1.4% according to the realclearpolitics average. When he ran against Elizebeth Warren of Massachusettes he trailed by about the same amount and ended up losing by 7.5%. The two polls that have shown Scott Brown in the lead by one polled the most amount of people and and had the smallest Margin of Error. 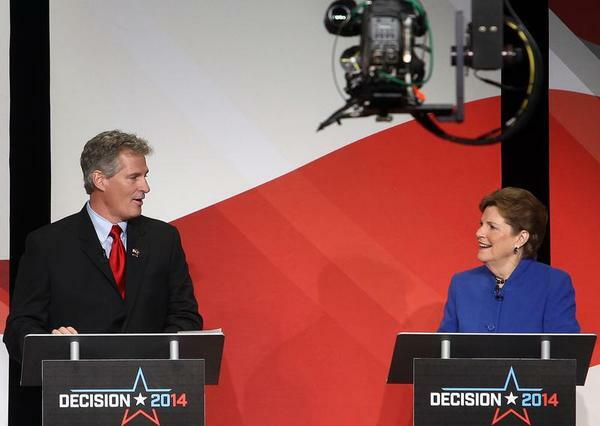 However four recent polls have shown Jeanne Shaheen with leads between 1 and 3 percent. 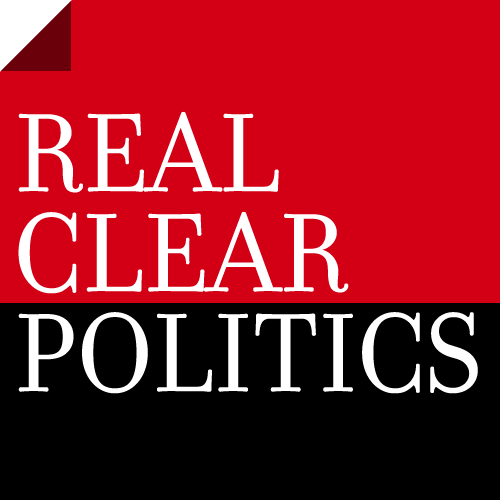 So overall the race may even be closer than the 1.4% edge that Shaheen has according to RCP. It seems as though with this race, like many races it's going to come down to turn out. That didn't work out so well for Brown in the race against Elizebeth Warren. She did about 6 points better than the polling predicted. See here! Brown has been able to cut into the lead by depicting Shaheen as very partisan. He points out that she has voted with President Obama 99% of the time. This while he votes with both sides of the political isle. CNN anchor Wolf Blitzer even said he voted with Obama 78% of the time and Brown conceded he voted with the Obama 50% of the time. Brown explains that that is what America needs. Someone who is willing to work with both sides and be independent. Brown said he supports America using the fossil fuels we have here and being energy independent. He supports using the new and environmentally safe fracking that has helped America produce more of it's own oil. Shaheen emphasizes keeping tabs on polluters and opposes fracking. On immigration, Brown said he would support a pathway to citizenship but only if it comes with better border security. That is why he said he would not support a current bill proposed by both a Republican and a Democrat that provides a pathway to citizenship. Shaheen supported the bill. As the two candidates get ready to debate this Friday(it will air on Sunday 11am channel 7,1pm channel 6) sources say a federal probe is being launched to investigate Cory Booker and whether he illegally profited from his political office while he was Mayor of Newark. Booker's former law firm made millions from a contract with the Newark Watershed Authority, an organization that Booker was the chairman of as mayor of Newark. Booker received 700,000 dollars from his law firm while he was mayor of Newark. Booker claims he did nothing wrong and the $700,000 was rightfully due to him because of a separation agreement he had for work he did for them before he became Newark's mayor. Tune in Sunday 11am abc7, 1pm abc6 to the debate to find out how Booker responds. Corey Booker still enjoys popularity although it is declining. A Stockton poll had his favorability at 50% while his unfavorable rating was at 42%(5% higher than a month ago). Jeff Bell's favorable was at 38% while his unfavorable was at 18%. Booker has taken it to Bell for not living in NJ until this past February and says Bell can blame himself for not being well known in NJ. Bell ran twice for NJ Senate, in 78` and 82`, then moved to Virginia. When Democrat Cory Booker agreed to debate his Republican challenger only one time, he received a lot of criticism. Booker responded by simply saying he didn't have enough time to debate Bell more than once. After receiving continued criticism, Booker says that he is "offended" by these complaints and adds that Bell needs name reocognition and he is try ing to get it by being on the same stage with him in debates. Booker points to the fact that Bell moved to Virginia in the mid 80's and didn't move back to Jersey until this past May. He says Bell wouldn't have this name recognition problem if he had been living in NJ for the past 30 years like he's been. Booker also cites that Bell's wife hasn't moved to NJ with him as a reason why Bell doesn't deserve more than one debate. Booker would seem to suggest that this shows a lack of commitment to NJ. Bell has responded by saying that his wife had to stay in Virginia because the job she had is supporting the both of them. Bell says the job that he had to quit to campaign for senate was responsible for 60% of their income and if his wife had to quit they would be on food stamps. 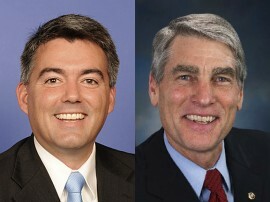 In-spite of the fact that Barack Obama has low approval ratings in Colorado, even lower than the nation as whole, Democrat Senator Mark Udall has shown fairly strong poll results agianst his Republican challenger, Cory Gardner. Udall has led in six straight polls. All between 2 and 6 percent leads. The latest poll has shown Obama's approval numbers in Colorado at 39%. He has been doing a few points better nationwide. Polls taken throughout 2014 have shown Obama's approval numbers in Colorado below the national average. Obamacare hasn't polled well in Colorado either. A Rasmussen poll found support for Obamacare at only 39%. When Rasmussen did a nationwide poll it showed 44% supported Obamacare. A quinnipiac poll taken a few months ago had shown support at 37% in CO while nationwide it was at 41%. Recent hypothetical polls have shown Republican challengers with small leads over Hillary Clinton. This in spite of the fact that she leads those same challengers by about 10% in nationwide polling. Clearly Clinton is dragged down by Obama, Obamacare, and the fact that she is an older candidate in a state that has a lot of younger voters. These results are interesting because Colorado has shown itself to be slightly more liberal than the nation as a whole in the last two presidential elections. The RD Index shows 1.5% pro Dem 2012 and 1.8% pro Dem in 2008. Why has Udall been able to stay on top in the polls? One reason could be finances. As of June 30, Udall out spent Gardner 7.9 million to 1.9 million and still had 2.4 million more cash on hand. 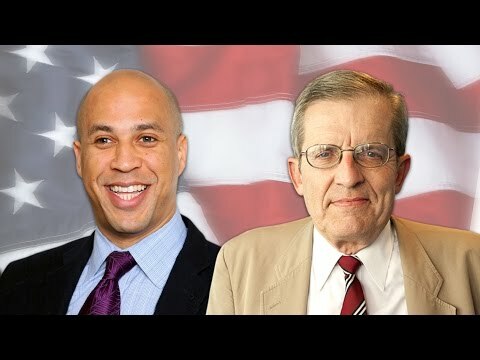 A recent CBS poll shows Cory Booker with a 46% to 32% lead on Jeff Bell. Another 5% are leaning towards both candidates. The poll surveyed 2239 likely voters. Whites respondents were split with 39% favoring Bell and 37% favoring Booker. The black respondents were unaminous. Of the 119 black respondents 104 said they supported Booker and another 8 said they were leaning towards Booker and 7 said they were not sure. ZERO said they supported Bell with not even a single black respondent saying they were leaning towards Bell. The poll takers were not able to get enough blacks to answer the polls so they weighted the 119 responses to equal 281. Hispanics and other minorities were also weighted to reflect much higher numbers than actually responded. The actual poll results were 46.2% for booker and 41.2 for Bell. If you subtract those who only said they were leaning it's 41.2% for Booker and 36.2% for Bell. The poll shows Booker is strong among blacks and other minorities inspite of his ethical issues regarding Watershedgate and the rising crime rate in Newark during his tenure as mayor. A CBS/NY Times poll has just given Cory Booker only a 50 to 43 percent lead over Jeff Bell in the New Jersey race for Senate. This was released on July 26th and was the only poll released in July. Earlier polls had Bell trailing by 13% and 20%. New Jersey leans strongly Democrat( about 14% more than the nation as a whole in the last election). Further more Booker has always been thought of as a strong candidate and seems to have achieved hero status in the mainstream media and even had a favorable documentary aired on PBS called Street Fight. Most observers would have had him pegged for a 25 to 30 point victory before the polling. Booker had been leading Lonegan in last year's special election in polling by 25 to 35 points in many polls taken 3 to 7 weeks before the election. He ended up defeating Lonegan by only 10.6%. And its possible that many Lonegan supporters were discouraged by the poor poll results Speculation that he did not have such a great record as Newark mayor and displeasure with his party's president Barack Obama is hurting Cory Booker . NJ has not elected a Republican to the senate since 1972 even though the state leaned Republican through the early 1990's. As of June 30, Mike Braley has outspent Joni Ernst 4.4 million to 1.4 million. He has a cash on hand advantage of 2.7 to 1.1 million. After 4 consecutive polls showing the race tied, Mike Braley has taken the lead the last two. He has a 4 point lead in a Loras College poll that sampled 1200 likely Voters. A cbs poll with a sample of 1764 gives him a 2 point lead. These results are signicant because the samples are large enough to be reasonbly reliable. Polls have also shown Joni Ernst with higher negative ratings by about 5 to 6 percent. This could be refective of the financial edge that Mike Braley has over Ernst. Inspite of the cash advantage his campaign has he is hitting her hard for being backed by the Koch brothers. The Koch brothers are conservative billionares who have contributed money promoting a pro conservative political agenda. They do this though a social welfare group called Americans for Presperity. The Koch brothers did not donate directly to Ernst's campaign, they did spend $500,000 attacking Mike Braley in January. Since then a Democrat super PAC has spent $459,000 attacking Ernst for being "backed" by the Koch brothers. Learn More about Joni Ernst Here! Learn More about Mike Braley Here! Even in a slightly leaning Democrat state like Iowa, 1.9% Democrat according the DB index, republicans should have a built in advantage because of Obama's low approval ratings. Republican Joni Ernst is in a dead heat with Democrat Mike Braley in a race that could decide the balance of power in the senate. So far Mike Braley has raised 7.1 million and Joni Ernst has raised 2.5 million. The Republicans have been trying to win this Louisiana senate seat for a long time and they seem to have their best chance in 2014. Louisiana has turned heavily Republican since the 1990's but that didn't result in taking over a senate seat until 2004 when Senator David Vitter defeated his Democrat opponent. Landrieu is going for her fourth consecutive term and would really be bucking the odds by achieving another victory. She would be defeating a solid candidate in a very Republican state. According to the DWB index Louisiana was 21.1% pro Republican in 2012 and 25.8% pro Republican in 2008 with Romney and Mccaine winning the states by 17 and 19 percent respectively. Bill Cassidy leads Mary Landrieu by 3% in the only recent poll taken. Polls taken in late July and late June showed the race even tighter with Cassidy ahead by 1% and .5%. As of August 2nd, Landrieu has out spent Cassidy by a huge margin so far. 8.5 million to 3 million. However, Cassidy has a slight advantage when to comes to cash on hand with a 5.6 to 5.5 Million advantage.